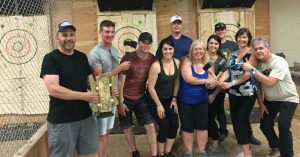 Send a Kid to Camp, AXE-Travaganza!! On Friday June 16th, we held a new fund raiser headed up by our Board Chair, Kim Fenton. 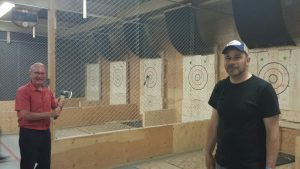 Now, it turns out that axe throwing is the latest, greatest thing (who knew?? ), but we’re here to tell you the reason it’s so popultar is it’s seriously fun!! It was also a seriously successful fund raiser!! 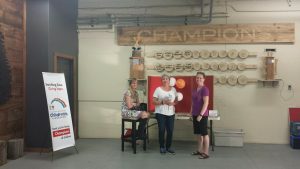 With donations from local businesses of 28 balloon blast items, and 18 silent auction items, combined with monetary and pizza donations, as well as ticket sales, we raised over $10,500.00 to send 27 kids to camp!! Paul Bunyan clearly has nothing on our overall axe competition winner, David Cox of Brant Basics! 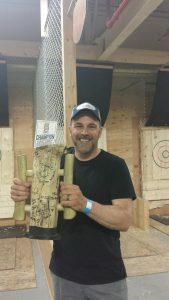 Special thanks go out to Peterborough Axe Club owner, Carlo Raponi and his fabulous staff for their enthusiastic “steel chucking” instruction and a fun-filled night of friendly competition, not to mention the generous contribution of 55% of all ticket sales donated to Send Kids to Camp! Thanks to our board members, Bob Martin and Donna O’Shaughnessy for participating and helping out. 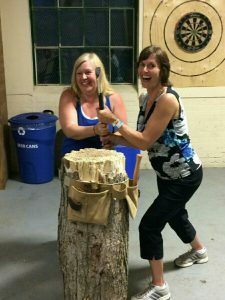 Renee Schartner and Kathryn Darwin also deserve special accolades for pitching in to help out on AXE-Travaganza night, as does everyone who came out to pitch axes in support children receiving services from the Kawartha-Haliburton Children’s Aid Society. On behalf of all our campers, thank you. We simply could not do what we do for local children without your help. Bob Martin and David Cox in a throw down! Renee, Anne and Lisa at the Balloon Blast table. Clowning around with the big axe! Next Next post: Local Credit Unions Support Summer Camp!